Before we jump into this month's guest post, we have some big news to share with you: the Woolery is under new ownership! Chris and Nancy Miller would like to thank everyone for many fun & fibery years, and we wish them well on their new adventures. Our new fearless fiber leaders are Wave and Perri McFarland, who are committed to continuing the Woolery’s focus on personalized customer service and enhancing the fiber enthusiast's overall shopping experience. You can still expect to find the most extensive array of supplies and equipment, both online and under one retail roof when you visit the Woolery in historic downtown Frankfort, KY. 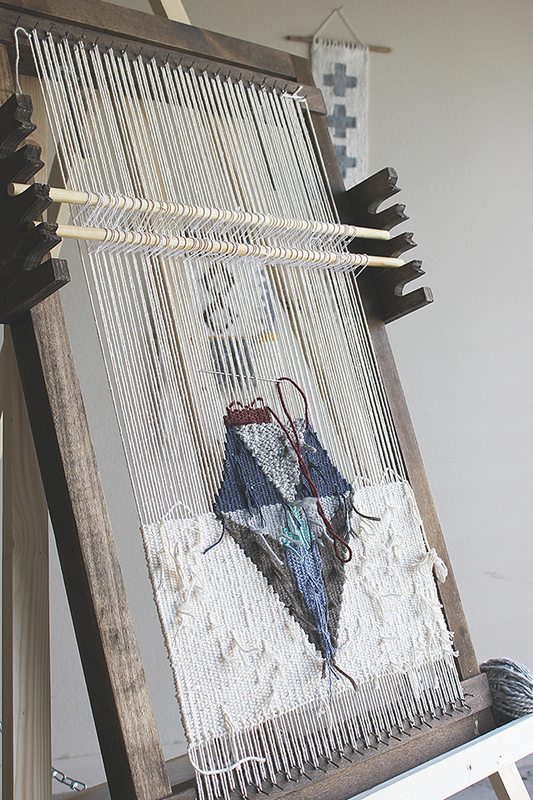 Without further ado, we're pleased to share this little bit of weaving inspiration with you. Enjoy! I learned early on that the process of weaving is an endurance test. When I decided to make my first weave, I grabbed an empty frame, pushed some pins in the top and slowly started replaying Sandy’s tutorials on youtube. What I thought would be an afternoon project turned into 3 days of frustration, pulling out stitches, wondering why my sides were curving inward and getting back cramps from bending over. When I finally, triumphantly, cut the weave off the makeshift loom and turned it over, I realized that all of my ends stuck out straight like a fiber forest, and that the work was far from over. Another day later my small weave was proudly sewn onto a small stick and hung above my desk. The whole ordeal yielded a far-from-perfect wall hanging, but I was hooked and I haven’t looked back since. The drive to perfect my skills with the frustrating fibers led me to finding my absolute favorite medium. 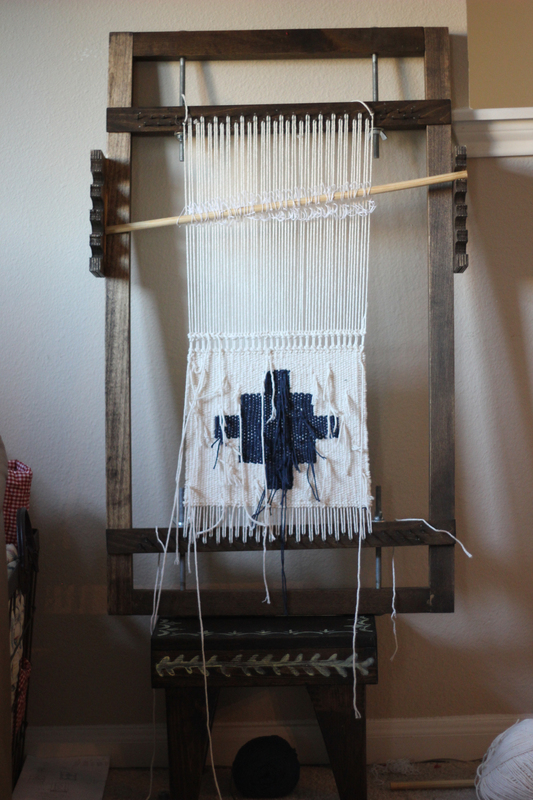 I have since spent hundreds of hours at my loom and made dozens of wall hangings. I have also built 3 different looms, each bigger than the last. Every time I stretch my creativity and cut a new weave off the loom, I slightly dread the ‘housekeeping’ chores of weaving in all of the ends and sewing on the stick. I’ve learned a few tricks with every progressive weave I’ve worked on and now when you walk into my studio, you will see looms with yarn woven upside down and backwards. Why? you may ask. The short answer is: My method is my own because it works for me and keeps me from pulling my hair out after I’ve worked so hard on a design and want to simply cut it off of the loom and move on to the next idea. The reason I enjoy weaving from the back is simply so that I can weave in my ends as I work on the weave. A beautiful back is almost as important as a beautiful front in my opinion. I use the weaver’s knot to hide splits of the same yarn and when I reach the end of the color block I simply pull the needle, along with the end, down along the warp string through the previous 5 -6 weft rows and cut it flush to the weave. By weaving in my ends while they are on the loom, I maintain the tension needed for a tight fit that will hold in the end without displacing any of the straight rows from all of my tugging and pulling. When I need to add texture stitches such as rya, I simply turn my loom around to view the front and add them before turning it back around to the back to continue weaving around them. Finishing a weave with a polished back is the equivalent of feeling like a weaving ninja. Plus, it saves time and yarn! Weaving upside down is a much more popular technique among weavers. My favorite method of attaching the stick to the top of the wall hanging means requires my warps to meet in pairs at the top with a loop between them. It also requires about 2-3 inches of space before the first row. By weaving upside down, I never run out of room as I near the top of my design. I believe that the top of a wall hanging should be the priority while the fringe at the bottom is an afterthought. Beginning with the fringe doesn’t make sense to my designs, so I turn the loom upside down and try to imaging my design from a bat’s angle. Sure, sometimes this means I don’t quite know how the weave looks until I take a break to turn it right side up, but more often than not, it turns out better than I expected. Sometimes this also means that I have to modify weaving techniques that are done right side up, but it sure is good for my dexterity practice! Whenever I get questions from new weavers about building their own looms, I always give the same advice: discover your own weaving style and then build/find a loom that works with your comfort method. Weaving from bottom to top? Left to right? Creating shapes and then filling in between them? All are the right way to weave as long as they are right for you. As I learned early on with my first weave – discovery and endurance are the biggest motivations to continue fine-tuning your craft. They provide the perfect amount of elation and frustration to keep pushing you. Happy weaving! Lindsey is the weaver and blogger behind hellohydrangea.com. Her work includes bold graphic designs with soft, subtle textures. She enjoys teaching weaving tutorials and connecting with the fiber community online. She currently resides in Texas, USA with her husband and two dogs.